(M) Mens Vintage 70s Short Sleeved Disco Shirt! Light Blue Paisley on White! 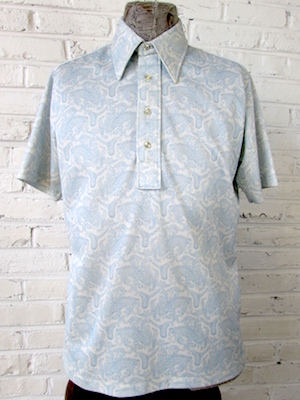 Home > Men's Vintage Shirts > Men's Vintage Shirts: 1970s > (M) Mens Vintage 70s Short Sleeved Disco Shirt! Light Blue Paisley on White! Mens vintage 1970s short sleeved disco shirt. 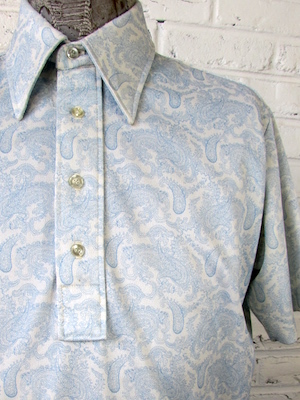 This funky white shirt is covered in light blue paisley. Has a super wide & pointy disco era collar. Shirt is pullover style with an opening at the collar that closes with pearly white buttons. Tagged by Izod. 100% Polyester. Condition: Very Good. Has a very light yellow-ish stain on the right sleeve.